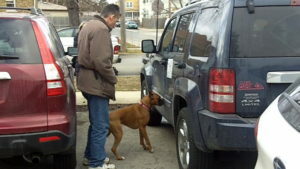 Tom has been actively involved with dog training for almost 9 years. He’s an active member of the American Boxer Club, Midwest Boxer Club, Tree Town Boxer Club and the Lyons Township Dog Training Club. Tom has taught agility for over 5 years from the foundation to the advanced handling levels and has also taught obedience for beginners. He and his dog Killian currently have 20 titles in AKC Obedience, AKC Rally, AKC Agility and NACSW Nose Work. Tom and Killian also compete in CPE and NADAC agility. Tom has been involved with nosework for almost 5 years and has served in most of the roles for hosting a trial (Volunteer Coordinator, Element Lead, Judges Steward, Videographer, Timer and Traffic coordinator) as well as those roles involved in mach trials including judging. In addition, Tom began teaching nosework classes 2 years ago and has presented a number of seminars on the subject. Tom’s strength lies in his ability to see what others don’t see and use that insight to help the dog/handler team achieve their goals.